Zion Market Research has published a new report titled “Pharmaceutical Intermediates Market by Product Type (GMP and Non GMP), by Applications (Antibiotics, Antipyretic analgesics, Vitamins, and Others), and by Distribution Channel (Direct Sales and Distributor): Global Industry Perspective, Comprehensive Analysis and Forecast, 2017 – 2024”. 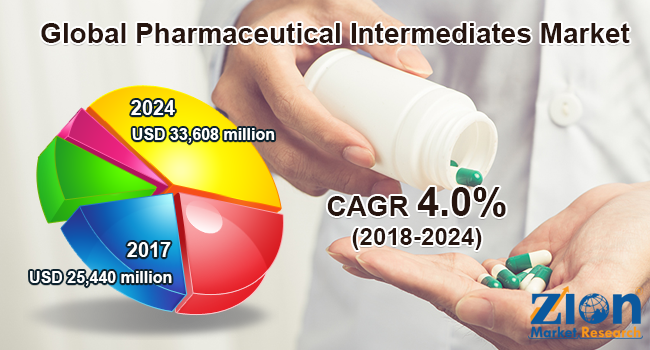 According to the report, global pharmaceutical intermediates market was valued at approximately USD 25,440 million in 2017 and is expected to generate revenue of around USD 33,608 million by end of 2024, growing at a CAGR of around 4.0% between 2018 and 2024. Pharmaceutical intermediates are chemical compounds which form the building blocks of the active pharmaceutical ingredient (API). Pharmaceutical intermediates are produced as a by-product during the production of API. Every reaction in the production process of API gives rise to various different pharmaceutical intermediates. Pharmaceutical intermediates are used in the production of bulk drugs and also for research and development purpose by various pharma and biopharma companies. Pharmaceutical intermediates are classified on the basis of product type, application, and distribution channel. On the basis of product type, pharmaceutical intermediates market is segmented into GMP and non GMP. On the basis of application, pharmaceutical intermediates market is segmented into antibiotics, antipyretic analgesics, vitamins, and others. On the basis of the distribution channel, pharmaceutical intermediates are segmented into direct sales and distributors. Key regions of pharmaceutical intermediates market are North America, Europe, Asia Pacific, Latin America, and the Middle East and Africa. North America is expected to dominate the pharmaceutical intermediate market over the forecast period due to the presence of developed countries such as the U.S. and Canada. Furthermore, the presence of various market players in the region coupled with the development of new products is projected to boost the market growth in this region. Europe is expected to be the second largest growing region after North America. The Asia Pacific is expected to be the third largest and fastest growing region over the forecast period due to the presence of developing economies such as China and India. Also, a rise in the number of diseases has led to an increase in the demand for pharmaceutical intermediates in the Asia Pacific region. Latin America and the Middle East & Africa markets are expected to grow moderately, owing to the increased prevalence of diseases. Some of the major market players of the pharmaceutical intermediates market include A.R. Life Sciences Private Limited, Vertellus Holdings LLC, Lianhetech, Dishman Group, Midas Pharma GmbH, Codexis, Inc., Chemcon Specialty Chemicals Pvt. Ltd, Aceto Corporation, Cycle Pharma, Dextra Laboratories Ltd., BASF SE, Sanofi Winthrop Industrie S.A., ZCL Chemicals Ltd., and Easter Chemical Corporation, among others.